Coming at you from the folks who organised the Prohibition and Blitz Party nights, SS Atlantica is going to be dreamy this Sautrday. 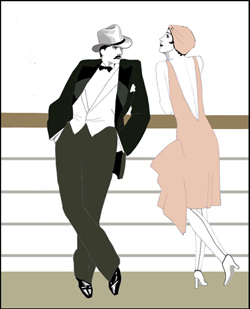 It aims to relive the glamour of a ‘30s ocean liner, and comes complete with cabaret, dancing and live bands. Don your nautical finest and jump on board! If you’re of a nervous disposition, don’t fret; it’s not on an actual boat, it’s on a non-boat. The event takes place on a faux liner on St. Katharine’s Docks. The organisers themselves described it as a “champagne-sodden foray”, but we imagine it’ll be far more glitzy than that. A truly dress-to-impress affair, gents are told to emulate the Agatha Christie villain, while the ladies ought to take inspiration from the silver screen’s lush layers of silk and fur. St. Katharine’s Docks aims to recreate the vision of a luxury cruise liner’s ballroom, with balustrades and portholes enveloping white-tableclothed round tables and bars serving pristinely-made cocktails and champagne. In keeping with its authenticity, there’ll be shuffleboard, Bridge and dominos for those whose non sea legs require a bit of respite. SAILING FROM: Commodity Quay, St Katharine Docks, London, E1W 1AZ. Buy tickets here.